The site on Auchtertyre Farm, part of a hill farming research centre run by Scotland’s Rural College, now holds 23 wigwams, five lodges and two separate toilet/shower blocks. The first two, basic and un-serviced bothy style wooden tents were installed end of 1993 and welcomed their first customers over Easter 1994. They were next door to a camping field and a portaloo. Two years later electricity was installed with an access road provided. By 1997 there were four plugged-in wigwams on offer. For Rena Baillie, Manager of Strathfillan Wigwams, things have changed over time too. The West Highland Way has played an important role in the development of facilities at Auchtertyre. On typical busy days there can be up to two hundred walkers and the through-traffic keeps the shop busy. They serve thousands every year, including charity events like the annual Caledonian Challenge which finishes on SRUC’s Kirkton/Auchtertyre research farms. While walkers often use the wigwam accommodation or the camping field many long distance travellers are just as grateful for the coffee, bacon rolls and access to toilets, according to Rena. 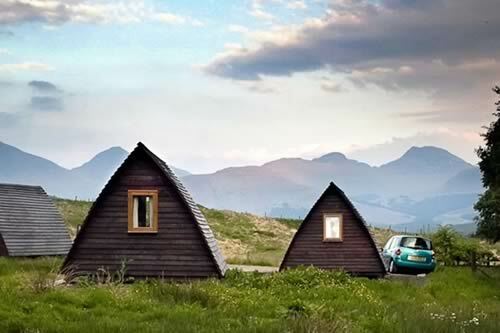 The Strathfillan Wigwams were one of the founding members of the Wigwam Holiday network, often made up of farmers who have diversified. There are now 62 locations in the UK and Ireland. In twenty years the only time the wigwams have been closed was during the Foot and Mouth disease outbreak. While the demands made by holiday makers will change, Professor McCracken believes there will always be a demand for a countryside experiences offering something out of the ordinary.